Sharing the audio from a DAW like Logic Pro over an internet chat application like Google Hangouts is extremely useful when collaborating with someone remotely. Our goal is to be able to start a Google Hangout and have the audio from our DAW and the sound from our microphone shared simultaneously over the chat. To accomplish this were going to route the audio from Logic through Soundflower into Ladiocast out to Google Hangouts. Setting this up is pretty straight forward but it is easy to make mistakes and get confused with all different connections. Note: this guide is for Mac OSX. 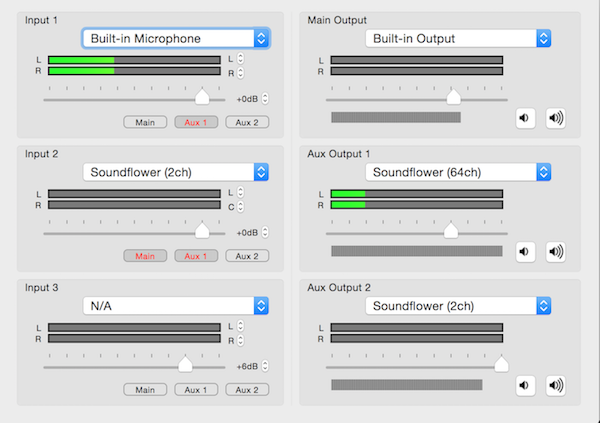 Soundflower is a sound routing application that provides virtual audio interfaces. It also contains some mixing capabilities so you may at first think this is all we need to accomplish our goal, however, you’ll soon discover there is really no way to mix down to a single channel which is what we need inorder to pipe our audio to Google Hangouts. So once you download and install Soundflower you can forget about it for the sake of this project. We’re only interested in using the default virtual audio interfaces it provides out of the box. Next we want to setup our DAW to output to Soundflower 2ch. I’m going to use Logic Pro in this example but any DAW should work. This is telling Logic to output to the virtual audio interface that Soundflower has created instead of outputing to our speakers or sound card. Ladiocast is pretty powerful software that can be used for streaming audio to servers. We however are only going to use its most basic feature, the mixer. All we want to do is route our Microphone and Logic to our Speakers and Aux Out. To do this open Ladiocast and chose your microphone as Input 1 and Soundflower 2ch as Input 2. Then click the Aux 1 button below Input 1 to route Input 1 to Aux 1 and likewise select Main and Aux 1 from Input 2. Make sure you don’t route Input 1 to Main because that will cause feedback if your microphone is able to pickup the sound coming from your speakers. Next use the drop downs on the right to set your speakers as the output for Main and select Soundflower 64ch as the output for Aux 1. Next we need to route Soundflower 64ch (where Ladiocast Aux 1 out is being sent) into the input of our Google hangout. To do this simply start a Hangout then click the setting gear at the top of your Hangout screen. 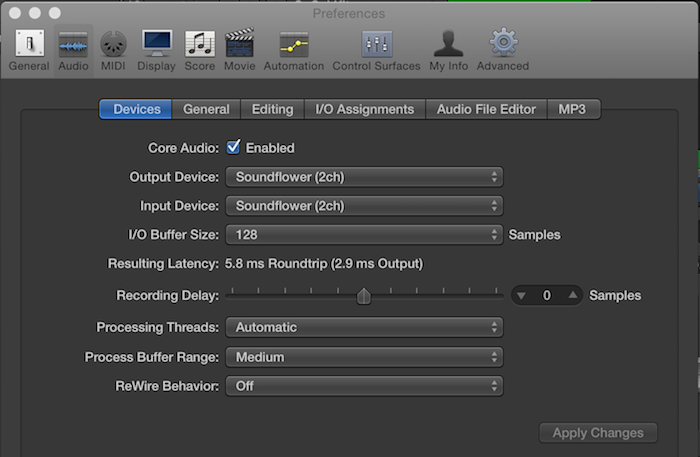 Next just select Soundflower 64ch as the input source. To accomplish our goal you don’t need to change anything in System Preferences. 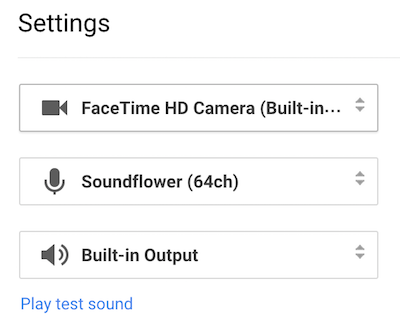 All the other guides I’ve seen out there that use Soundflower and Ladiocast to share audio require you to change your sound settings in System Preferences. Part of the reason I wanted to write this post is because there’s really no need to do that so long as the program outputing sound (Logic) is able to choose where it sends sound to (Soundflower). There may be some use cases where you want to change the output to Soundflower 2ch so that all your system sound gets routed to Soundflower 2ch . Or perhaps you want to change the Input to Soundflower 2ch so that everything being sent to Soundflower 2ch is able to be recorded. However, for our purposes, we don’t need to modify System Preferences. So with that you should be good to go. Have fun making music in a way that The Postal Service could have only dreamed of.